MEADOWPARK HOLIDAY CAMP, GAILES – once the biggest holiday camp of its kind in Europe. The camp was located just off the old Irvine to Troon Road in a large field opposite today’s Booker Cash and Carry. In the 1934-35 valuation roll for the parish of Dundonald in the County of Ayr, there is an entry for Meadowhead Farm Camping Ground that lists the names and addresses of the owners of almost 130 holiday huts. The huts had started going up in 1933 when a group of Glaswegians who had previously spent their summer holidays under canvas in nearby Barassie decided to set up a more permanent summer base. Robert Wilson, owner of Meadowhead Farm near Gailes, rented out a large field to this group of holidaymakers and by 1934 the camp, now known as Meadowpark, had dozens of huts, including six shops, neatly arranged into four avenues with the aptly named Main Street at the centre of the little community. Below is a very interesting article on the holiday camp published in the Glasgow Herald in 2000. The last days of summer. It was once the biggest holiday camp of its kind in Europe. Now all that remains of Meadowpark is an industrial landscape and a motorway… Lukewarm autumn sunshine casts an eerie glow over the Caledonian Paper Mill, a sprawling assortment of colossal buildings and tall chimneys scraping the darkening evening skies over Ayrshire. In the fading light the mill could easily be mistaken for the set of a science fiction movie, a strange, alien world looming up in the midst of soft, green countryside. The air of unreality is heightened when workers clock off from their shift; people scurry amongst the massive buildings, busy ants dwarfed and overshadowed by their own creation. The A78 road, a busy dual carriageway connecting Troon and Irvine, runs along the front of the mill, which is situated between the two seaside towns. Running parallel to the A78, following part of its journey towards Irvine, is an older, quieter road separated from the dual carriageway by dense, unkempt hedgerow. Walking along the narrow grass verge it is possible to glimpse the sharp, angular shapes of the mill through gaps in the hedge and hear the sound of cars whistling past on the main road. About halfway down on the right-hand side are the barely discernible remains of a gateway, the entrance to a broad track that once led somewhere long before the anonymous concrete road and the industrial estate beyond were a gleam in a town planner’s eye. Since the early nineteenth century, Glaswegians have been going ”doon the watter” for days out and annual holidays. Camping and B&B in places such as Rothesay and Saltcoats became traditional holidays for the working classes. After the First World War camps of wooden holiday chalets grew up in various places along the Ayrshire coast. Some lasted only a few years but one remained in constant use for over 35 years, through another global conflict and the hard years of post-war austerity, through the ”never had it so good” 1950s and the seismic social and economic revolutions of the 1960s, before giving way, in 1970, to the development of a new road and industrial estate for nearby Irvine. In the 1934-35 valuation roll for the parish of Dundonald in the County of Ayr, there is an entry for Meadowhead Farm Camping Ground that lists the names and addresses of the owners of almost 130 holiday huts. The huts had started going up in 1933 when a group of Glaswegians who had previously spent their summer holidays under canvas in nearby Barassie decided to set up a more permanent summer base. Robert Wilson, owner of Meadowhead Farm near Gailes, rented out a large field to this group of holidaymakers and by 1934 the camp, now known as Meadowpark, had dozens of huts, including six shops, neatly arranged into four avenues with the aptly named Main Street at the centre of the little community. By the time of the 1935-36 valuation roll Meadowpark had grown to encompass almost 300 huts, arranged in eight avenues, as more and more holidaymakers, mostly from Glasgow, grabbed the opportunity to have their own little place in the unreliable Scottish sun. One of the first hut-owners was Wullie Stevenson, a goalkeeper with Clyde, who lived in Parkhead, Glasgow and became a founder member of the Meadowpark Hut Owners’ Association. Today his son, also Wullie Stevenson and a former Motherwell, Airdrie and Albion Rovers player, is retired and lives with his wife Rose in Troon, although both are Glaswegians. From an early age they spent weekends and summer holidays at Meadowpark and, in time, took their own three children on holiday there until the camp closed. ”There was a committee who set it all up,” says Wullie Stevenson. ”The Big Five, they were called. There was my father, David Livingstone, Danny McLaughlin, Geordie Simpson and Jimmy McLeish. It was the biggest holiday camp of its kind in Europe at one time. There was a waiting list to buy a hut, and if you wanted to sell you had to sell to someone on the waiting list. There were never any vacancies, as people tended to pass their huts down through the family. ”Your hut was always spotless because the committee could come round at any time and tell you to either get it tidied up or get out,” says Rose. ”They used to walk round the avenues every week, and if somebody’s hut was looking dilapidated then the committee would step on their toes to get it painted. You weren’t allowed to just put a let into your hut, you had to notify the committee first. It was different for family, but because of the rent you were only allowed to let your hut twice a year.” The huts, built by the residents themselves, were small and basic, with no gas or electricity, and old-fashioned dry toilets outside. Heating came from the range on which meals were also cooked, and paraffin lamps illuminated the huts when the summer sun finally set. For people used to living in the cramped confines of Glasgow’s old tenement communities these were only minor inconveniences. The opportunity to escape the noise and grime of the city at weekends and during the summer was something many Glaswegians treasured, and with an annual rent of #1 in the 1930s, it was within the means of many working-class families. ”I used to go down to my Auntie Annie’s hut,” says Rose. ”We had a terrific stove that had little hobs and you could do everything on it. Remember what they had in Little House on the Prairie? It was like that. The stoves ran on coal that you got from the Camp Stores. Milk, papers, you name it, and you got it there. You would carry the water down to the hut in two big pails from the communal taps outside. I had a big urn we would fill that ran into the sink. I had a big tub for doing the washing and it was great. ”It was a different way of life and our three kids were brought up down at the huts. The young one was only a baby, but he went for the last year. It was a sin it had to go.” One of the least popular tasks was cleaning out the dry toilets, which were emptied, scrubbed, and lined with dry grass every week. One of the less prosaic names for the van that came to collect the contents of the toilets was ”the chocolate van” although Wullie Keary, the caretaker who collected the sewage, was known more straightforwardly as ”The Shite Man”. Meadowpark, also known as Toytown to locals, became a bustling hive of activity during the Glasgow Fair holiday, a mini-Glasgow by the sea. On Fair Friday buses and trains were packed with families making their way down the coast to the camp. Boys in Irvine made a killing by meeting the holidaymakers off the train in Irvine and, for a small price, wheeling their luggage in a barrow out to Meadowpark, more than two miles away. Local shops also cashed in on the influx of people and prices shot up. ”Irvine was booming during the Glasgow Fair,” says Wullie Stevenson, ”absolutely booming”. During the Second World War the camp was full of women and children sitting out the summer months in the relative safety of Ayrshire while bombs fell on Glasgow. For children more used to playing in Glasgow’s back courts, Meadowpark and its surrounds must have seemed like a verdant paradise. The camp itself had a small play area with swings, and the beach was a short walk away. As long as they were respectful of the farmer’s crop, anyone from Meadowpark could cut through the fields opposite the camp to reach Gailes beach, which, being a little too far out for inhabitants of Troon or Irvine to bother with, was usually deserted. In the late 1960s, Irvine, a designated New Town, was growing furiously as new housing estates were built for families from the Glasgow overspill, several attracted to the area because of their long association with Meadowpark. Land with good access and drainage was sought after to entice new companies to set up in the vicinity and one of the prime sites was Meadowhead Farm. Charles Wilson, son of farmer Robert, decided to sell his land and that included Meadowpark. In 1969, a long and at times bitter dispute began as the Meadowpark Hut Owners’ Association fought the plans of Irvine Development Corporation (IDC) to turn their camp into an industrial estate. Although the holidaymakers owned the huts, they only rented the field from the Wilson family on a yearly basis. The association appointed Peter McCann, a Glasgow solicitor, who began lengthy negotiations with the IDC to establish whether the hut owners could block the development or, if that failed, whether they were entitled to compensation or the use of another site. At the same time the Hut Owners’ Association began writing to MPs, the Lord Provost of Glasgow, William Ross (Secretary of State for Scotland), and eventually 10 Downing Street to plead their case. Local support for Meadowpark was limited and in 1969 the Irvine Times referred to Meadowpark as a ”shanty town” and said there was ”no place for it in the New Town”. The Daily Record, in December 1969, was more supportive, telling its readers that: ”Almost 300 neat little chalets are threatened with destruction”. The dispute dragged on as the hut owners’ solicitor fought for compensation, though legally the IDC was not obliged to provide any. Eventually Meadowhead Farm was sold for £30,000 and the Meadowpark Hut Owners’ Association was granted an ex gratia payment of £7000, approximately £25 compensation for each hut owner. ”The site then lay empty for ages and we were angry,” says Rose. ”They wanted us off the site because they said we were an eyesore, but if they had gone into the huts they would have seen how beautiful some of them were, like little bungalows.” My great-grandparents, John and Lily Strang of Lawmoor Street, Glasgow, were also among the first to put up a hut in Meadowpark. 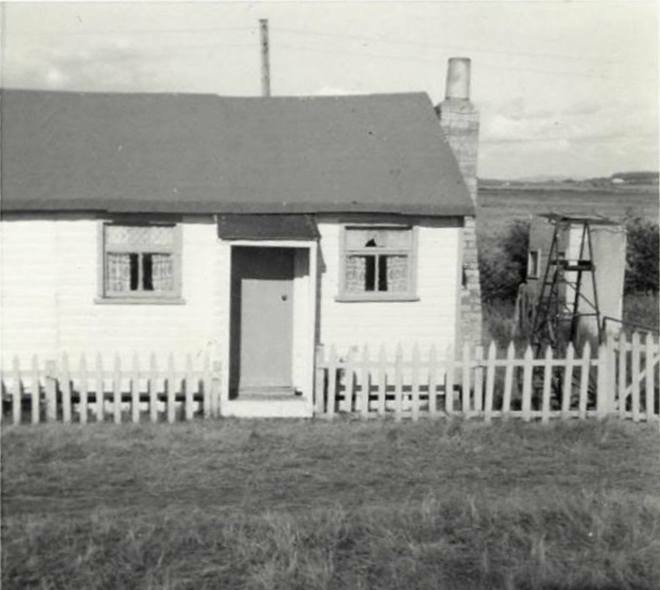 The Strang hut stayed on site until the very end and four generations of the family spent their holidays down at Meadowpark. I remember little of Meadowpark, but I grew up hearing my grandparents and other members of the family reminiscing about all the good times they spent there. I used to think that hindsight had possibly lent a rosy hue to their memories; a camp of holiday huts in Ayrshire did not sound very exciting to someone who, at an early age, formed the erroneous opinion that real holidays meant going abroad. Today, listening to Rose and Wullie Stevenson speak of Meadowpark with an affection undimmed by the years, it is obvious that this was a unique community, although those who remember it and mourn its passing grow fewer every year. ”On a Friday night we used to go to the steamie for a bath at sixpence, go down to the Clydeside and catch the bus to Meadowpark for the weekend,” says Rose Stevenson. “The bus stopped right at the gates and you met up with all your pals and talked about what you were doing. A lot of people who had businesses could have gone anywhere on holiday, but they still went to Meadowpark because they just loved the way of life down there.